You read that right! 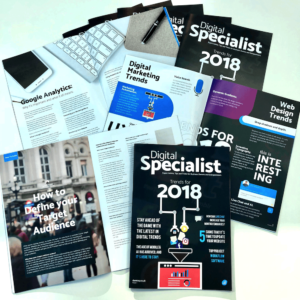 We’ve launched the first issue of our magazine, the Digital Specialist. Having spent the last 12 years delivering exceptional experiences for our clients, this magazine marks an important step in our journey. We wanted to find further ways to provide actionable insights and advice to help you grow your business and this magazine does just that. Filled with latest trends, how-to guides, and insightful articles written by our in-house team of specialists, we’re sure there’s something for every business owner and entrepreneur. Eager to get your hands on a copy? Click here to order your FREE copy of our magazine whilst stocks last! Previous Post Digital Marketing Trends of 2018 – Part 3 of 3: Technical.